WHAT DO THE FESTIVALS MEAN? 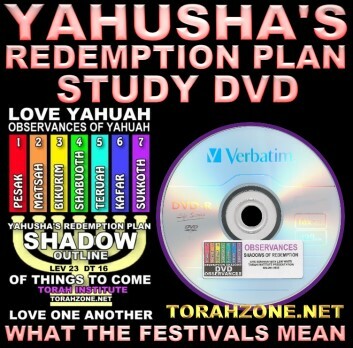 The Redemption Plan of Yahuah is shadowed in festivals during the year. These show us "the way" Yahusha is redeeming His bride. They are found at Lev. 23 & Dt. 16. One of them is Yom Kafar, Judgment Day. Yahusha Himself, and Peter and Paul, reveal the Day of Judgment (by fire) that is still ahead of us. "I was in the Spirit on the Master's (kuriakos) Day" in order to reveal future events to the assemblies. It is only confusing because our slumbering teachers fumble with the meaning of words in their context. By not feeding the sheep "every Word that proceeds from the mouth of Yahuah,"
the sheep remain unprepared for the day set by Yahuah to remove the weeds (Acts 17:30-31). The 10th day of the 7th moon will be our day of redemption, just as it was instituted by Yahuah to be. It will also be the day of termination by burning as we read about in Joel 2, Zeph. 1:14, Obad. 1:15, Psalm 91, Isaiah 24, Amus 5, Mt. 24, and others. The final warning is to "Come out of her My people" - Rev. 18:4 - in order we not receive the plagues coming in the end of days. Christians have been misled about the end of days. The message for the last days is given at Malaki 4:1-6: "Remember the Torah of Mosheh." It's confusing because most are taught to "not" live by every Word that proceeds from the mouth of Yahuah. At Kol. 2:17 we read of the "shadow of things to come." This has been poorly understood until these last days before the return of Yahusha. 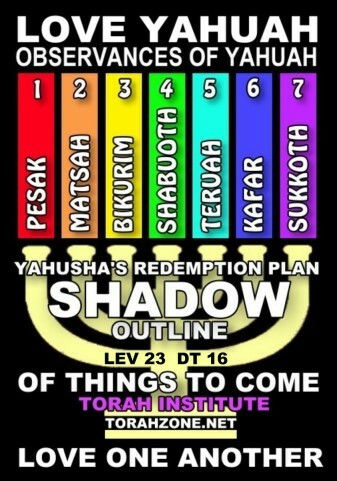 The redemption plan of Yahuah’s people (which includes those formerly gentile persons engrafted by joining with Yahuah through the Covenant) is outlined (shadowed) in the annual appointments we are commanded to observe each year: the moedim. These moedim are now understood to be REDEMPTIVE festivals that make use of agricultural symbols. As we observe them year after year, they teach us Yahusha's process and His involvement in our redemption. Why Christianity Does Not Observe Passover? Constantine outlawed the weekly Shabath and Moedim, and criminalized all who observed the Torah of Yahuah. The Council of Laodicea confirmed this a few decades later (370 CE), and resting on the 7th day was outlawed. The Mother Circus interprets Scripture using a method called eisegesis. Everything is filtered through what is already set in place by man's previous misunderstanding, and what is not understood is labeled the "mysteries." Mankind must graft-in to the original olive tree, and join to Yahuah through His everlasting Covenant, trusting in Yahusha's blood as their complete redemption. This is why Christianity never had the observances, or understood them. The Council of Nicaea outlawed the observances of Yahuah, and set up the 4th avatar of the beast, the teaching authority of Babel. Passover, First-fruits, Matsah, and Shabuoth have seen their fulfillment with Yahusha’s first coming as the Lamb of Alahim (Passover), then He resurrected as First-fruits (Wave-Sheaf Offering), and finally indwelling His first followers (Natsarim, branches) to write the renewed Covenant on their hearts (and ours) at Shabuoth (Acts 2 & 3). Matsah is the seven-day observance when all leavened bread is removed from our dwellings. The meaning of doing this points to - is the shadow of - removing all the teachings of men we have listened to, corrupting our minds with puffed-up ideas. The teaching authorities of men seek to dominate us with the goal of controlling our behavior. We are set free of their leaven by living only by every Word that proceeds from the mouth of Yahuah. We become "unleavened" by abiding (living) in the Word. Leaven is the old wine of men's teachings, and we must become a renewed wineskin. Our wineskin is our heart, or mind. There is a growing world-wide movement of Yahusha's followers awakening on the Earth right now. More about leaven: WHAT IS LEAVEN? The final unfulfilled festivals of these agricultural metaphors concern the harvest of the Earth, and are shadowed in the 7th moon of the year. The first day of the 7th moon, the day of the shout (Yom Teruah) foreshadows the resurrection of the First-fruits who have died, but are raised to life just prior to Yahusha returning to reign. Then, on the 10th day (Yom Kafar), the reapers are released to destroy the unrighteous who are not sealed with Yahusha’s Name (those who are not His property are burned). This is judgment day, the fall of the reign of Babel. It is also the day of our redemption. Finally, the wedding supper of the Lamb follows as the malakim gather us who remain (Natsarim sealed for protection, Ps. 91) from the ends of the Earth to be with Yahusha. This is called Sukkoth, Tents, or Tabernacles. If you watch The Reapers on youtube it will explain a great deal about the harvest festivals ahead of us. "Here is the endurance of the set-apart ones; here are those who are guarding the Commandments of Alahim and the belief of Yahusha." “Blessed are those doing His Commands, so that the authority shall be theirs unto the tree of life and to enter through the gates into the city." "Blessed (happy) are those practicing the Talmud." The Talmud did not exist in the days of Yahusha, Paul, Luke, and the rest of the Talmidim (students). It was the yoke of the "oral law," the traditions of the fathers, and Yahusha nor any of His followers had anything to do with it. There is still a division over what some perceive as traditions "orally" handed-down. Every Word of Yahuah was written, and read aloud to the people. The oral instructions, or traditions of the fathers, was the paradigm Paul said was his former way of living by. "For you have heard of my former way of life in Yahudaism, how intensely I persecuted the assembly of Alahim, and ravaged it." - Gal 1:13. Note the phrase, "former way of life." Rabbinic Judaism is the "teachings of the fathers." Acts 15:10: “Now then, why do you try Alahim by putting a yoke on the neck of the taught ones which neither our fathers nor we were able to bear?" It is what was added (the leaven of men's teachings) that Yahusha called "old wine." The traditions of men are the object lesson from Matsah (Unleavened Bread). We must become unleavened, purging the teaching authorities and corrupting influences of men's ideas which block the pure and clean objective of love, which the Torah's goal is to teach us.